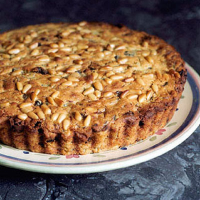 To ensure that this courgette and pine nut cake has a sweet taste, it is best made only in early summer, when the courgettes are still very small. Preheat the oven to 180˚C/gas 4. Grease and line the base of a 20cm high-sided flan tin or springform cake tin. Sieve the flour and baking powder in and fold in with the sultanas, grated courgettes, 50g pine nuts and the lemon zest and juice. Transfer the thick batter to the tin and scatter with the remaining pine nuts. Bake in the centre of the oven for 40–45 minutes. When ready, the cake will be slightly brown on top and a skewer inserted into the centre should come out clean. Leave the cake to cool completely in the tin before turning it out. 2006 Mosel-Saar-Ruwer, Germany. Bin 702028.